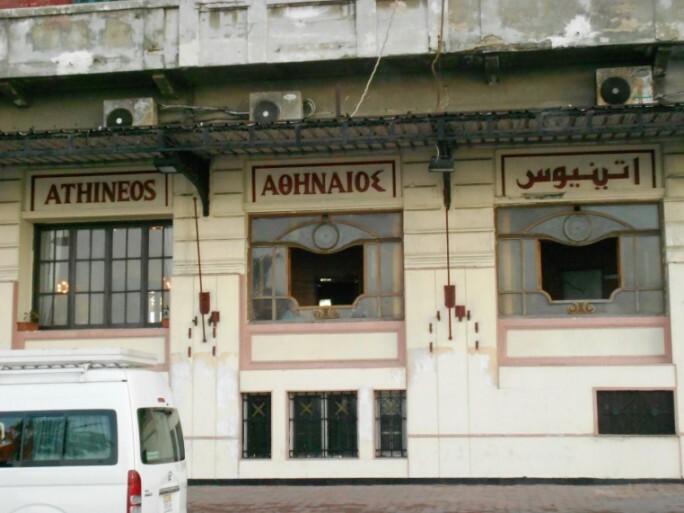 A fast-moving French train leaving from Ramses Station in Cairo will take you to the ancient city of Alexandria in a comfortable three hours. This city, on the coast of the Mediterranean sea, beautifully mixes Middle Eastern and European flavors and breathes a rich history that takes you into days gone by. How do you capture this city when you have only twenty-six hours of time? 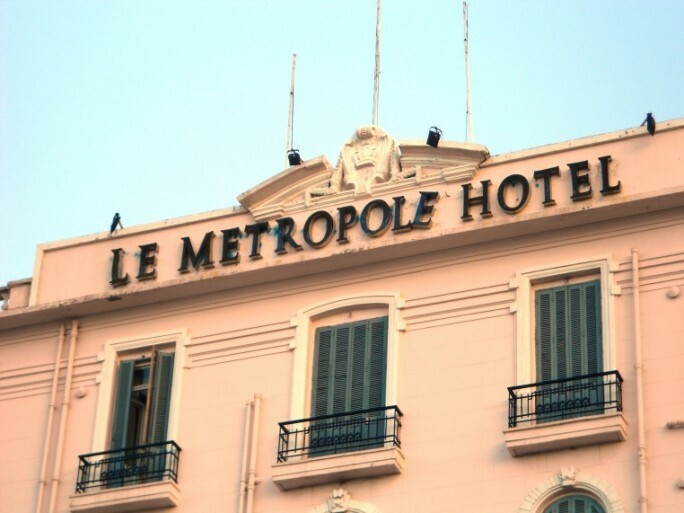 We began by eating lunch at the Metropole Hotel opposite the Corniche, where ghosts of Christmas past lingered in both the decor as well at the methodical, slow service of the staff. Satisfied with Egyptian pizza, fresh lemon juice, and sandwiches we headed off to explore the city. 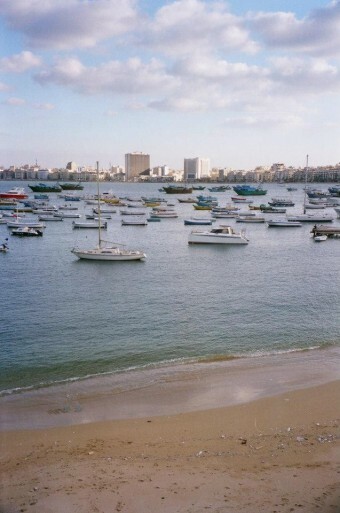 Sea air greeted us as we walked along the Corniche with the Mediterranean Sea and palm trees to our left and minarets and old buildings to our right. 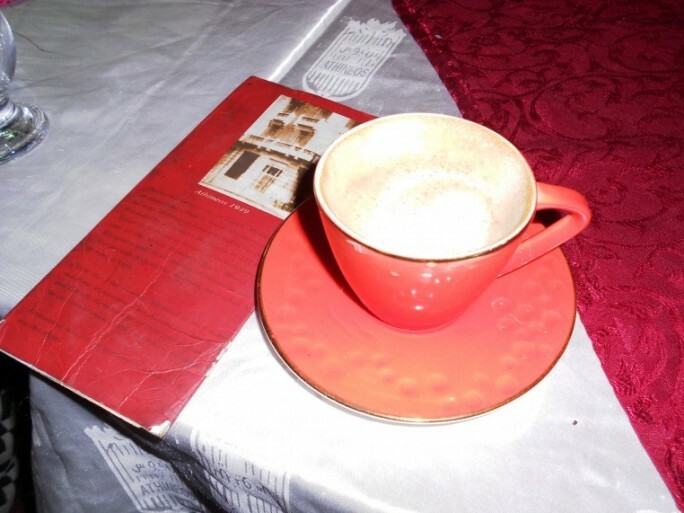 An afternoon stop for cappuccino at the Athineos hotel, known to seasoned travelers as number 47 in the list of 107 things to do in Alexandria, Egypt by Lonely Planets travellers was a perfect rest before continuing our walk around the city. We hailed a taxi and set out to find a hotel that seemed real online but began to feel like a figment of the internet and my excitement of a “cheap but beautiful” hotel as we drove…and drove…and drove, finally finding it off a dark alley called a street. Our fears that this would be a dive never materialized – the hotel was as beautiful as represented and the owner even more so. If you’re ever in Alexandria look up Alexandria Mediterranean Suites. While it’s a good distance from downtown, it’s a short walk to the Montaza Palace and in an ideal place to experience local coffee shops and shisha. After settling in, we set out later in the evening to go to the Montaza Palace and enjoy late night mint tea and the obligatory shisha given the setting at a local coffee shop. The morning began with an amazing breakfast, courtesy of the Mediterranean suites. Ful Beans, fresh pita bread, fresh white cheese, oranges, hard-boiled eggs and hot tea gave us a healthy start to our day, a day that would be packed full of the city. The famous Library of Alexandria was first on our agenda. The ancient library was considered to be the most significant and well-known library of the ancient world. 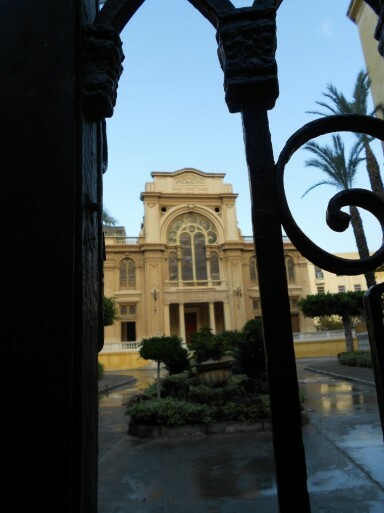 It’s history dates back to the 3rd Century BC when it was known as a place of great scholarship. 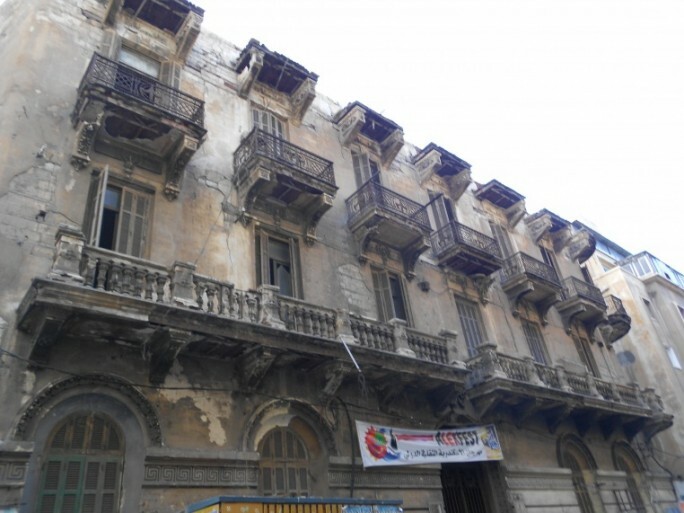 The original library was destroyed but exactly when and how that took place is still a mystery with several theories. Ten years ago the library was rebuilt and is an impressive building and complex that includes museums, specialized libraries, millions of books, a planetarium, internet archive, art galleries and beautiful, permanent exhibitions that include famous Arab artists. It is incredible. We are not normally “tour” people but were delighted with a free tour as an option and gained a greater appreciation through our lovely tour guides clear and concise history and knowledge of the library. 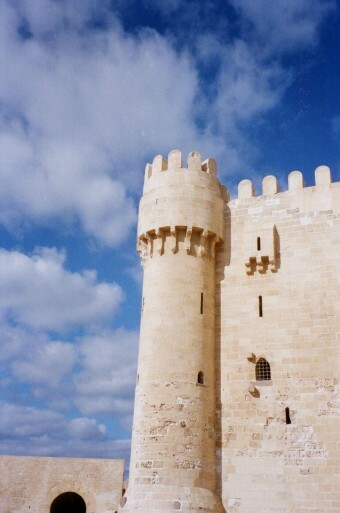 The Citadel of Qaitbay was our next stop. 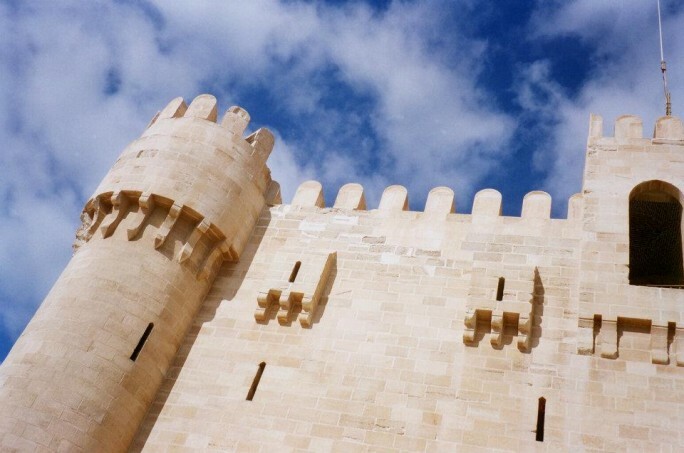 This fort was built in the 1480’s and shares the sight of another famous landmark that was destroyed – the famous Alexandria lighthouse. There was a never-ending supply of eager, self-appointed guides adding a humorous touch to the experience. We had only to walk a few feet to enjoy the Greek Club Restaurant. Eating fresh fish, served any way you like, whether it be grilled or baked, was beyond believe-ability. 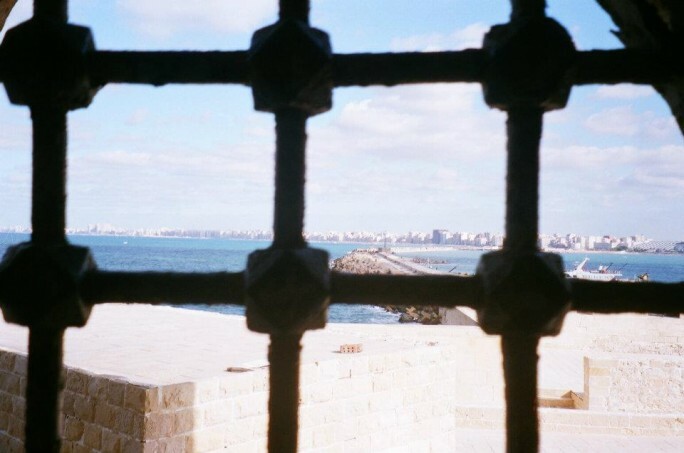 The Mediterranean Sea stretched out in front of us and with that a perfect view of the city of Alexandria. This restaurant is also on the list from Lonely Planets and ranks at number 36. Keeping close track of time so we wouldn’t miss our train back to Cairo we decided we had just enough time to go to the catacombs. The catacombs are in the east section of Alexandria and without the skill of two taxi drivers we would never have found them. Through narrow streets filled with water and sewage, past markets with suitcases and clothes, between auto parts and people, as hidden as is possible are the catacombs. Shocked that we had made it we asked the taxi drivers to wait. They were delighted to oblige and settled themselves at a coffee shop directly across the street from the gates of the catacombs. But getting there was just one obstacle “It’s closed” said the gate guards as we walked toward the entrance. We burst into our best and most persuasive Arabic mixed with English and finally a reluctant guard took us on a speed tour through the catacombs. These ancient caves designed like the catacombs in Rome deserve a far less rushed tour but the speed tour held a good dose of humor and was unforgettable. We had checked our cameras at the gate as they are not allowed inside the tombs but despite this “set in stone” rule, the guard at one point said “Take a picture! You must take a picture”. Trotting off to the gate house he brought my daughter’s camera and she was able to get pictures that would never have been allowed had we been there with a crowd of visitors rather than a private “after hours” tour. With profuse thanks and a good size tip we left the catacombs and headed to the station. There was just enough time for four of us to grab tea and pound cake while the other two went high-speed to a used book vendor and then the familiar sounds of a train whistle alerted us to the imminent departure of our train. 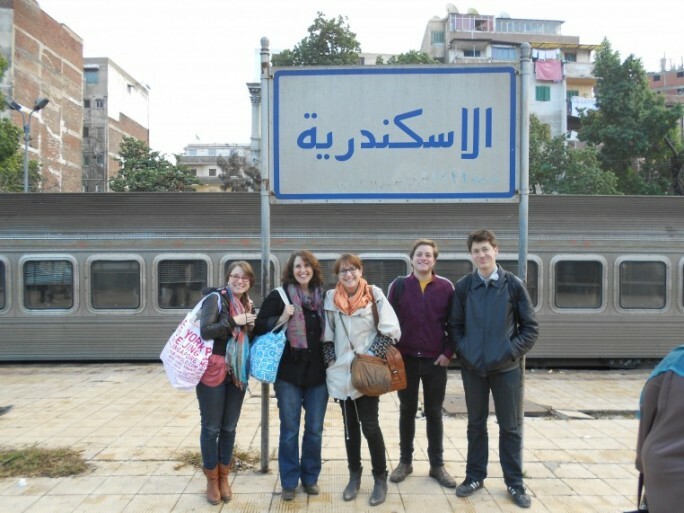 We arrived back in Cairo and on leaving the station were greeted by the city that never sleeps. Cool night air busy with the sounds of horns, shouts of vendors and others on the street, and the final Call to Prayer rising in a persistent echo around the city were sounds of home. 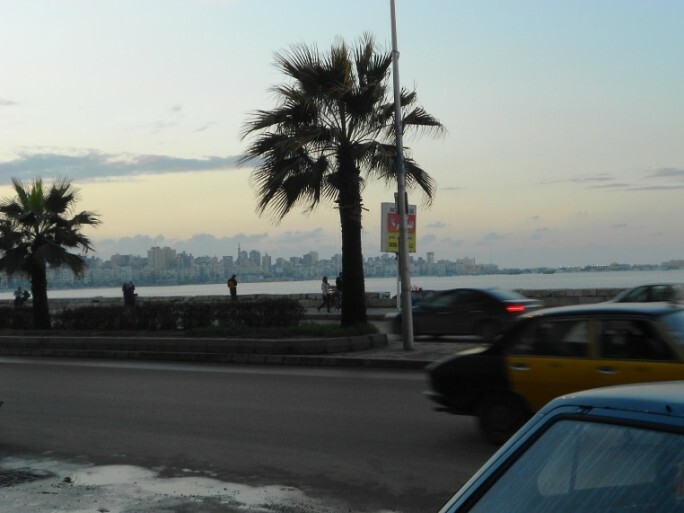 The moments in Alexandria had sped by like the cars and taxis on the Corniche but we were now back with the magic of the city lingering in our dreams. These are the moments to live in fully alive and present, the moments where there are no regrets.